Xun has spent many years studying with a dual lightsabers, both seperated and connected. Finding advantages to both, Xun has custom built his saber to sepate in the middle, allowing the option of using either a lightstaff, single blade, or dual sabers. This allows him more versatility in battle. 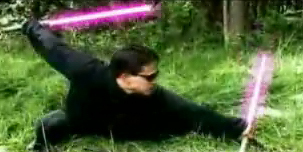 In addition to this, his Saber is dual phased, meaning he can shorten or lengthen the blade at will. Focused, driven. Xun is a quiet individual, compassionate of others, even if he doesn't show it that much. He believes in the art of combat, in honor. He won't give up, at least not until he's dead. He fights with a cool determination and focus, and is very hard to distract. Raised on the forested world of Chenshin, Xun's mother was a Jedi healer, so she knew from the start of her sons talent. Instead of being taken to Curascant, her son was raised on his homeworld in the Jedi temple there primarily under the tutalage of Sang D'Teng. He learned well of the connection of the force to the world around him, the overwhelming life force of the plants and creatures permiating him. In this environment, Xun developed a strong relationship with both plants and animals and learned to draw strength from them should he need it. Xun became a strong force user, excelling in physical excercises, force manipulation when it came to moving or pushing objects, using the force to crush steal, reading minds, even to fly at times... typical jedi traits. Thanks to his mother, he inherited some of her healing talent. Typically, a Jedi uses the force to heal themselves or others. Xuns querk: Although he can heal himself, he has a harder time healing others. Using the force, this process is slow. Thanks to his realationship with the plants and animals of his world, Xun found a way of sharing life forces between beings, allowing for a faster healing process (this is about the same as a Jedi healer). Typically, Xun will use his own life force to heal another. In Combat, Xun utilizes the force to maximize both his skills, mind, and body. During his training, Xun opponents thought him to be a "shadow". This was due to the fact that he would start move so fast and accuratley that one would think they were seeing double. Xun later dubbed this his "Shadow Step" Technique. Through extreme skill and use of the force, Xun's speed increases to the point that he leaves an after image of himself, seeming to be in two places at once. Many have fallen at this technique, unable to defend and keep pace against the onslaught of saber strikes that seem to surround them.